Well, I've finally joined the late 20th century and gotten a digital camera. I've had really good experience with my flow through bins and wanted to share them with you. 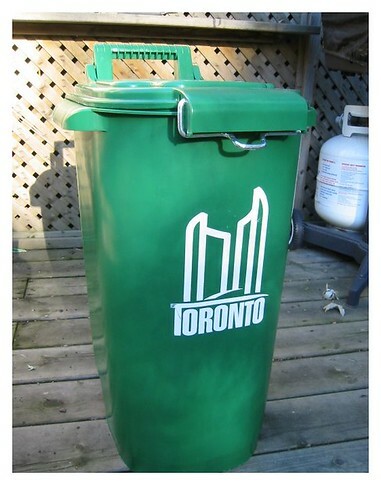 I'm single and live in a 20th floor studio apartment, so I couldn't do the big outside garbage can with wheels. I got 2 tall kitchen trash cans (about 9 months apart.) I got whatever was at Walmart, there's no other rhyme or reason to the color/shape choice. A friend took out a 'window' and I drilled holes. To create the 'bottom' of one, I used the kind of wire you use to hang up paintings just because that's what I had. For the other I used a thicker insulated copper wire because that's what the hardware store was selling as a remnant. I didn't even realize there was copper in there when I bought it. To secure the wire, I tied the ends around a bit of wooden chopstick. I put a couple of pieces of newspaper lining the bottom (being sure to have it go up the edges a few inches), and added a small amount of mostly finished VC (an inch or two). Then I put in the contents of a half composted rubbermaid bin, food and more moist shredded newspaper. For the white one, I only put 2 layers of newspaper down and clearly that wasn't enough. I put moist newspaper bedding down to keep escapees alive until I could get to them. For the tan one I used 4 layers of newspaper and that was more than sufficient. When I made the second (white) one, I used that opportunity to re-do the older one and put the wires 1 1/2" apart instead of 1". Here a knot was sufficient to secure the ends. There's no problem with potential escapees here because I made sure the newspaper went up the side of the bin. The first time I built this one, the newspaper went just to the edges and I had lots of explorers dropping down and not being able to get back up. In the past when I've harvested I've just used my hands (since I can put the bins up on a table and don't have to get on hands and knees). Some of the newspaper lining the bottom goes back in the bin for the first harvest. It takes a day or two but everything sinks back down to the wires and stays there. There's a little extra that falls through after the harvest, but that only lasts 2 or 3 days. From then on it's pretty solid. Mine gets really really dry to the point that I add water weekly to have some moisture so I don't kill off all the bacteria. My experience is consistent with Jason's. I add food and more bedding and come back a week later and the level of the contents are where they were before I added the previous feeding. I'm sure it slowly goes up, but it's not very noticeable. Part of the reason Is that I make sure there's lots of air pockets in my newspaper bedding. As that gets eaten it shrinks. I've got less than a pound of worms in each, so it's not the amazing eating machine that Jason's new flow through is, but it suits my needs perfectly. I hope I've inspired some small time indoor vermicoomposters to make a flow through next time they need to split their bins! Very nice Susan. They look the perfect size for an apartment. You didn't say, how many gallons of bedding do you figure your mini bins will hold? Those look like great systems and great examples. A simple (though my big bin is just as simple, really - just some holes and grating), small system like this is easy and cheap to make and will probably outperform a lot of commercial worm bins that cost a lot more. I think something like this is a great way to start worming, and for people that don't have a lot of food scraps (a household of 2 for example) it will probably be all they ever need, and it's always easy to make another if your demand increases. More and more from personal experience and testimonials from others it seems like flow-through is easily the best way to worm, and making things simple cheap and hassle free is the best way to get people involved. One of these days I might make a small flow through system out of the 'green waste' containers we have here for kitchen waste recycling. they are exceptionally sturdy and have wheels but still pretty small, 10 gallons I believe. Do I understand that you just put your food scraps in there? No freezing? NO thawing? no chopping it up? I like that it solves the harvesting dilemma right off the bat. If you have a big enough flow through with enough worms, you understand correctly. For me the advantages are that food does get processed more quickly than in my rubbermaids - I'm assuming because of the air flow, and when I've harvested, there haven't been any worms or any cocoons (no babies weeks later), in the VC. Since it works that way, I don't harvest until just before I need the VC, so the worms have maximum time to get out. Also, when you first start, put about 2 inches of processed VC there so the worms don't have to get to the VERY bottom to process things. Not everyone has been quite so lucky about having NO worms in the bottom harvested portion, but there weren't many (by report). When I harvest, I scrape off the bottom off about an inch at a time until I start getting poorly processed bits of bedding or a worm or two. I also try to wait many months in between harvests or (more commonly) don't harvest all the way up to unprocessed stuff, just taking the amount I need. They say a little VC goes a long way, so I mix it in my soil for my potted plants about 80% dirt and 20% VC. As the amount of VC I'm making increases, I'll increase the % VC. I can grow on my balcony all year here, so 'spring' doesn't mean all that much as a starting point for growing. This also means I don't need a huge amount all at once. (Veges don't grow as quickly in the winter because of my building's orientation to the sun, but they still grow.) If you do need the huge amount in spring, I would harvest a little early to see if there are cocoons that are going to hatch (is that the right word?) I'm still trying to build up numbers so I try to get EVERYONE out. The cost of worms here is MUCH more than for you guys and they sell by the ounce. There aren't many suppliers, and importing anything live from the mainland carries a hefty fine. It's not worth even thinking about (besides the reason for the ban - introducing unwanted stuff on our small island.) Blue worms are invasive, but they've been here for hundreds of years. BTW, I noticed something interesting today. I put a thin layer of spoiled apple sauce with a sprinkling of 10 year old flour on one side of my rubbermaid, thinking it would heat up a bit and the worms could hang out on the other side while it processed. Today I found 90% of the worms on the applesauce side!! I don't usually dig enough to tell, but when I found NO worms on the cooler side, I kept looking. I may start putting my food in the processor again for the rubbermaids. In the past I've had pockets of that go anaerobic, but I think I need to spread it out more thinly instead and perhaps layer it with the bedding (lasagna style). Again, the reason is I'm trying to build numbers and I want them to be as happy as possible so they'll reproduce. I could put stuff in 'as is' not chopping). I may get to the point Jason's at where he doesn't take babies out cuz 'there's more where that came from'! I haven't posted in over a year here. I just posted this on Jason's thread but thought I'd put it here for anyone following my mini bins. Hey Jason. I haven't checked this website it ages. I was telling you about 9 months or more ago that I had to add water daily to my mini flow through and the bottom was still dry as cement. You were amazed I was adding so much. I don't know why it took me so long to figure out the difference. I teach chemistry, it should have been obvious. I keep my bin on the balcony where it's subject to almost constant wind. I get a lot more evaporation. I also don't have a fitted lid and just put an empty cereal bag (cut to be double the normal size) on top. I don't want to bring leaves in and had a miserable experience with hand shredding newspaper (large junks of matted pristine newsprint many months later.) I got a paper shredder from a colleague who was leaving and have been shredding old phone books and REALLY like the outcome. I fluff the shreds and then soak them before putting them in on top of the newest food. Recently I've pulled the bin to just inside the balcony and don't have to add as much water, but still add 1.5 to 2 cups about twice a week. Because I'm in a studio apartment, this seems to be the best solution for me. For Peter, he probably doesn't get the problem with the newspaper matting as much because he also has leaves. I'm with you on adding minimal effort into this. The maximum I check them is twice a week and not always that. I feed them every weekend. The only time I had a problem with this is when I moved both my bins to the edge of the balcony when I had a guest staying. She was squeamish about the whole thing. I left them there after she left and they were in the hot afternoon sun for weeks without water. It was an 'out of sight, out of mind' type of thing. I killed off a lot of them and am back to just one bin for now. The population should grow again and I'll go back to 2 eventually if I don't ignore them again for too long. When I did the major cleaning - dumping out everything from both bins to find worms to salvage, I harvested about 8 gallons of well finished compost from the bottoms of the bins. I now have a mix of blues and reds and they congregate at slightly different levels. It seems to work well. Thanks for the update, Susan. FYI, we now have a list of DIY Flow Through Bins. Your bin is listed towards the top. LOL...well, I see from another post you've already seen the FT list. Hope you check in more often. Your posts were very helpful to me when I first joined this group.